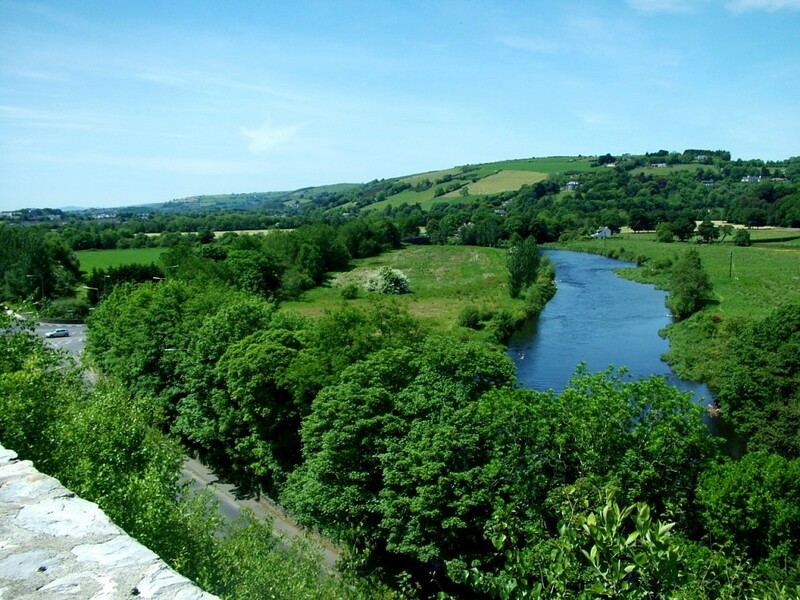 From Ballincollig, the Lee meanders towards the tidal water. Its journey is nearly over. On one side of the valley is Curraghkippane and on the other, soaring above the scene just before one encounters the Carrigrohane Straight Road, is Carrigrohane castle. Carrigrohane translated means Carraig Raitheach or ‘the rock of the ferns’. The second translation is Carraig Rothain or ‘the rock of the (hangman’s) noose’. Here, the geography of a place is, again, as important as its history. The development of Carrigrohane castle from its origins to the present day was inspired by its geographic location, so close to a cliff face and overlooking the Lee and one of the principal approach roads leading into Cork. In fact, its walls overlook Hell Hole — a favourite swimming and fishing haunt for many centuries that is near the present-day Angler’s Rest Pub. The development of the site began around the year 1180 when King Henry II granted Milo De Cogan, an Anglo-Norman lord, several hundred acres of land south and west of the walled town of Cork. In 1207 Richard DeCogan, a relative, was given the manor of Carrigrohane and his successors built a castle. In 1464, on the occasion of a new charter granted to the city of Cork, the western limits of the liberties of the city were extended to Carrigrohane castle. In 1317 William Barrett, in consequence of his father Robert working with the king’s armies against ‘the King’s enemies’, was granted two parts of the local land of ‘Gronagh’ and the castle on that land. By the 1400s, the DeCogans of Carrigaline returned as overlords of the Barrett property. In the 1500s, the castle supported the Irish Earl of Desmond in his revolt against the English crown. When the Earl of Desmond’s uprising failed, the Queen’s Lord Deputy (in around 1600) gave the lease of Carrigrohane to Sir Richard Grenville, on the condition that he would repair the ruined walls of the castle and build a new house. Subsequently, the lands were given to Sir William St Leger. The new house could be described as a Tudor castle – a type of semi-fortified mansion with three storeys lit by four windows on each storey. The medieval castle has partly survived next to the present-day dwelling. The builders of fortified houses were concerned with creating a formal plan based on renaissance lines in order to accommodate more luxurious living standards. Fortified houses were symmetrical and had a central doorway. The structures resembled semi-defended country houses, with many of the features found in earlier castle conceptions, such as crennelations, mural stairs and bawn walls, all being abandoned. Circa 1601 the Carrigrohane house and lands, through Warham, were granted to Abraham Baker and Barrachias Baker. In the 1640s, during the confederate war, Lord Inchiquin occupied the dwelling and large portions of the interior were dismantled. The site became the haunt of a man called Cope, who terrorised and robbed the countryside with his gang. In the ensuing years, the Baker family returned and the house was rebuilt. One of the sons, John, had a niece who married Peter Wallis. Their son John died in 1731 and the property passed to his brother, Barrachias of Ballycrenane in Cloyne. His daughter Clotilda married Sir Edward Hoare in 1771. The Hoares were a Cromwellian family. The house was reduced to a ruin again as the family squandered their fortune and were forced to abandon the structure. 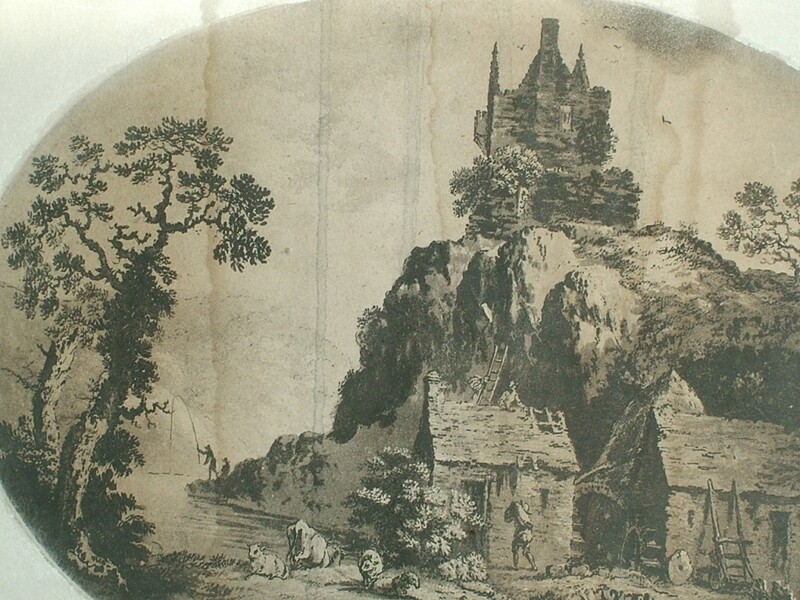 Around the year 1790 Nathaniel Grogan, a Cork painter, depicted the house gloomily with all its contours, located on its cliffside overlooking what look like flour mills in the foreground and two gentlemen fishing in the Lee. In 1837 Samuel Lewis referred to those mills and others in the vicinity when he noted that they were capable of manufacturing between 350 and 400 sacks of flour weekly. Around the year 1830 Carrigrohane castle passed to Augustus Robert McSwiney, a corn merchant in the city (at 18 Dunbar Street) who also owned Carrigrohane Flour Mills, mills, which are illustrated in Grogan’s painting (buildings were later demolished). McSwiney is reputed to have worked with Cork architects Deane and Woodward to carry out extensive reconstructions. One of the key features especially commissioned of the occasion was a chimney mantle piece emblazoned with the shields of the McSwiney family. During this time the Carrigrohane Straight Road, a two-and-a-half mile stretch of a new line of road from Cork, was constructed to replace the old road. Soon the McSwiney family ran out of money for refurbishment and in 1846 the Hoares bought the property back and lived there until the 1940s. In 1946 the house was bought by Mr Burnett and in 1976 it was purchased by Leo and Mary O’Brien. Today, the house is a splendid building retaining all of its charm and identity. Its owners, the O’Brien family, have ensured that the legacy of this historic building can be used in the modern world. As well as that, its long history has been remembered and commemorated in a wealth of papers and books by scholars like James N. Healy and painters like Nathaniel Grogan. Sincere thanks to the O’Brien family of Carrigrohane Castle for their courtesy and insights.